IAQSource.com > Articles > Condensation / high-humidity problems in your home? Condensation / high-humidity problems in your home? It is not uncommon for condensation to form on windows in your home during the cold winter months. With homes becoming "tighter" and more energy efficient - condensation on windows can be a year-round problem. Water droplets that collect on windows will eventually pool on the windowsill and window woodwork causing wood rot and mold / mildew. This article is designed to provide you with a better understanding of what condensation is and how to minimize it. Typically - cold outdoor temperatures in the winter coupled with excess humidity indoors are the main source of window condensation. Many homeowners elect to use portable humidifiers or install whole house humidifiers to combat the dry air produced by a conventional forced air heating system. Unfortunately, a humidifier is often the source of moisture that causes condensation - especially when outdoor temperatures dip below 10 degrees fahrenheit. Above, see a table listing the optimum indoor relative humidity levels at different outdoor temperatures. 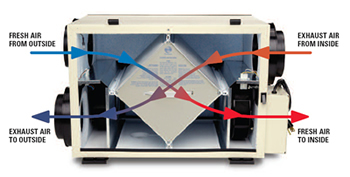 Manual humidistats (humidifier controls) are designed to maintain a constant level of relative humidity. So, what happens when a humdifier keeps the indoor relative humidity at 45% - but the temperature drops to below zero? Answer - pools of water on your windowsills. What is the solution to this problem? The automatic, or compensating humidistat solves the problem. This type of humidifier control works with an outdoor sensor to automatically reduce the call for humidity when it is especially cold outside. Most major manufacturers are now shipping their whole house humidifiers with an automatic control. Aprilaire now ships the # 58 automatic humidistat with it's "A" series of humidifiers (Aprilaire 600A, 700A, 400A, 500A). Honeywell has the H1008A1008 control with optional outdoor sensor. GeneralAire has developed the E2 automatic digital humidistat with outdoor sensor that also has an automatic control feature. Additionally, you can purchase thermostats with built in humidistats that incorporate an auto control feature. A thermostat with a humidity control can simplify your life by reducing multiple controls down to one. The best example of a control that does it all is the Honeywell VisionPro IAQ. NOTE: Honeywell calls the automatic control of humidity in cold climates "frost protection." Although generally high humidity is a common issue in the Summer months - it does not typically manifest itself as window condensation on the inside of the home. Summer condensation occurs when the outside window surface is cooler than the dew point temperature of the outside air. In the southeast US, summer dew point temperatures range from about 65F to 75F. When temperatures inside the building are within this range, summer condensation problems can occur. Since it's not possible to control the temperature or humidity outside - there is not much that can be done other than turning your air conditioning up, or buying high quality windows that reduce radiant heat transfer. Condensation issues can occur in other places in the home where humidity is high. With homes becoming "tighter" and more energy efficient - it can be difficult to control high humidity. We occaisionally receive calls from customers who have high humidity issues in the dead of Winter - a time of the year where dryness in the home has been the enemy in the past. In a tight home with high humidity problems - one must Introduce active humidity removal equipment (dehumidifiers) to the home, provide controlled infiltration of fresh air from the outdoors and/or provide increased ventilation or exhaust of stale air from the home. * Use exhaust fans in your kitchen, laundry and bathrooms. * Vent gas burners, clothes dryers, etc. to the outdoors. * Shut off furnace humidifiers and other humidifying devices in your home. * Be sure that the ventilating louvers in your attic, basement or crawl spaces are open and amply sized. * Open fireplace dampers to allow an escape route for moisture-laden air. * Air out your house a few minutes each day. * Upgrade your bathroom ventilation fans. Bathrooms are the # 1 source of moisture/humidity in the home so they need to be well ventilated. Quieter and potentially more powerful bathroom fans can be purchased to replace your old, noisy, ineffective fan. You could also upgrade your old bath fan to a new inline fan solution without extensive rework.. Fantech's BFRK100 conversion kit offers a powerful 122 CFM fan and the other materials you need to convert your old fan - all without tearing up your ceiling and removing your old grille. * Purchase a continuous ventilation solution. It is possible to purchase fans that run continously at low levels - providing the constant exhaust of stale air while consuming very little energy. The Panasonic WhisperGreen series ventlation fans offer a low power-consumption DC motor as well as continuous operation with spot ventilation boost. These fans are not limited to bathroom operation - and could be placed in a central living area or hallway. They are virtually silent and can provide substantial humidity reduction and general ventilation. One great new idea from Fantech for continous ventilation is the Ventech control system. Using an inline fan - the ventech system will run a vent fan at low speeds for intermittent or continuous ventilation with an on-demand 20 minute boost. * Install an Energy Recovery Ventilator (ERV) or Heat Recovery Ventilator (HRV). These air exchange units both exhaust stale air from the home AND bring in fresh air. The key to efficient ventilation is the HRV or ERV core - which heats or cools incoming fresh air, recapturing 60 to 80 percent of the conditioned temperatures that would otherwise be lost. * Install a dehumidifier. Actively attack high humidity at it's source (often the basement or crawlspace). These products use a refrigration process to extract moisture out of the air. They can even be tied in with the central forced air heating and cooling system. The Aprilaire 1700 provides a tremendous amount of flexibility in this regard - providing duct collars and control options that tie in easly with the central system. Extensive information on dehumidifiers is available at http://www.dehumidifierexperts.com/.